Ad billboards and signs influence customer thinking in a variety of venues. That is why you can realize ad success when you use a vehicle wrap. In fact, according to research that was performed by the AAA in 2015, drivers spend just over 45 minutes driving each day. That calculates to about 300 hours annually. In addition, a study, conducted by the Traffic Audit Bureau of Media Measurement showed that vehicle ads generate between 30,000 and 70,000 daily impressions. If you are a company then that uses vehicle wraps, you will find that you are getting your money’s worth. However, to make sure the ad response is successful, you also need to make sure the style of the ad is right, that the design captures the consumer’s attention and that the vehicle wraps you use are of high quality. Ad graphics for vehicle ads are available in simple letter designs that feature a business name and phone number as well as full-graphic wraps that are used to outfit an auto, car or even a bus. Regardless of the style, you still need to stand out, especially in a world that is full of imagery. Both full and partial vehicle wraps visually create a rolling billboard when displayed on moving cars, trucks or vans. To build awareness, make sure the lettering is basic and easy to read – that it spells out your business’s name and message. Colors and placement are important considerations. Look at the ad before it is included on the vehicle. Can you easily recognize the visuals and what the ad is telling you? You want to convey the same message to the customer too. Do not use more than two or three coordinating colors. Otherwise, the ad may look rather confusing. You can quickly dampen the appeal of your business if you do not choose a quality vehicle wrap. Do not use a wrap if it is peeling or faded. This type of presentation can prevent your prospects from contacting you and using your products or services. A quality vehicle wrap is therefore important as a poor-quality covering can do more harm than good. The ad should be placed with great attention to detail – highlighting the ad message as well as the imagery. When creating your ad design, you need to incorporate some science. Work with an ad wrap company that uses specific software for creating designs. Take a picture of where you may wish to park your vehicle and see what colors and graphics work in that particular environment. Emphasize the most important details of your ad, including the company name, website, and phone number. You don’t want the contact information melded into the design. Make sure the design draws the consumer to record your contact details instead. Remember, a motorist only has about 3 to 6 seconds to read your message. Therefore, the positioning of the message and contact details count. All in all, you want the vehicle ad you select to garner the attention of potential customers, underscore the key contact details and do so on a quality wrap. 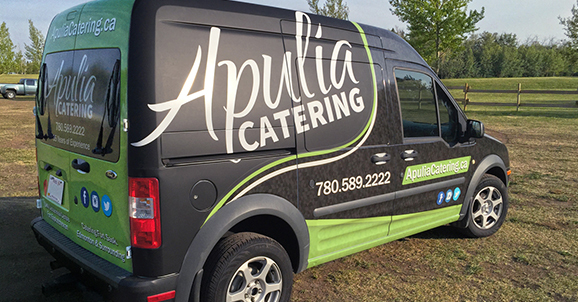 Aligning yourself with a vehicle wrap advertiser who knows everything there is to know about their trade will ultimately position you for success.